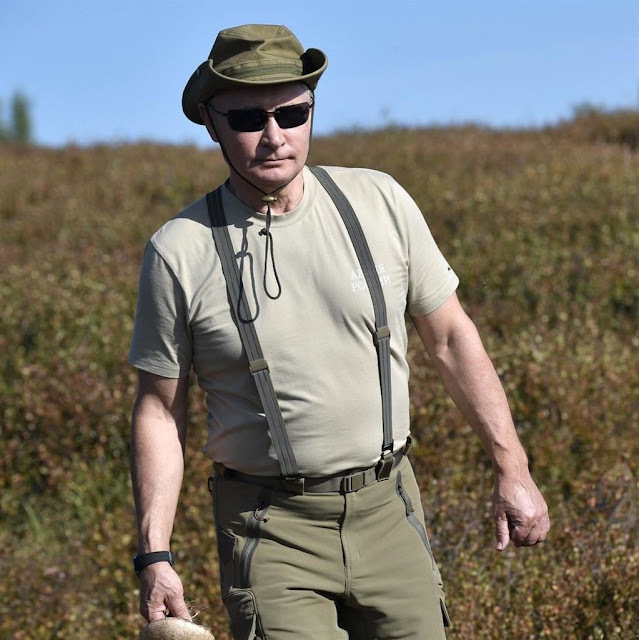 Machoman: President Vladimir Putin' summer break in Tuva,a remote region of Siberia. The world's strongman President was spotted during his summer break wearing a nifty hat and put on the shades at one of his favourite spots, in Tuva the wilderness remote area of Siberia. His spokesman said he spent last weekend hiking in the mountains with defence minister Sergei Shoigu and Alexander Bortnikov, the head of the FSB intelligence agency. Some photos issued by the Kremlin showed him on the Yenisey River. Putin is 65 years old but his longtime Judo training, the best physical, mental and moral pedagogy that has kept the doctors at bay and making him fit and strong. In his public appearances, he is obviously very sharper than most 40-year-olds, whereas his posture and gentle gait suggesting an excellent physical shape just like an active serviceman. Mr Putin is not a candyman people like other states' leaders whose the comfort of their office bureaucracy never adorned them to see a natural sunshine or touch by the raindrop. As a trained KGB agent, stationed at Dresden in East Germany (December 1989) and he has worked directly with the East German's State Security Service (Stasi), the most feared and very effective secretive organization ever live on. Mr Putin learned many dark arts from communist secret police of the GDR. Indeed Mr Putin is very comfortable with all type of weapons. And being a President of the Russian Federal Republic he makes sure wherever he goes he is accompanied by the nuclear briefcase.